A group of armed men pulled off a series of four carjackings and attempted carjackings across the North Side in under an hour on Saturday morning, police said, leaving a string of damaged vehicles and a struck pedestrian in their wake. No one is in custody. Map and sequencing of this morning's events. The first carjacking attempt was made around 8:15 a.m. in the 1400 block of North Dayton. A driver reported that a man jumped into the back seat of their vehicle and tried to take the car. When the attempt failed, the offender took the victim’s personal property and got into a waiting silver Dodge Caravan and fled eastbound on Evergreen. About 20 minutes later, a woman reported that two men tried to take her car in the 1000 block of West Belden in Lincoln Park. 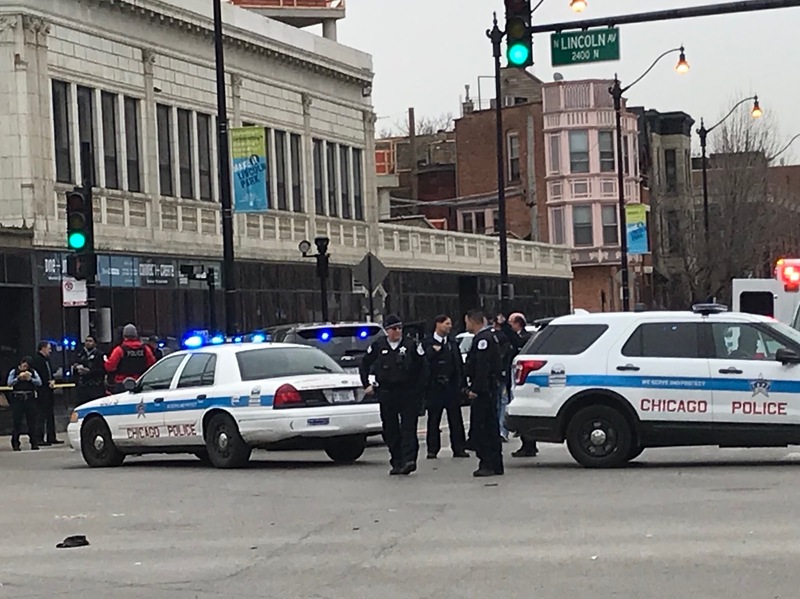 The woman, who is associated with DePaul University, said she was sitting in her car when a man emerged from a silver minivan and tried to open her back passenger door. It was locked, so he tried the driver’s door, which was also secure. The man returned to the passenger seat of the van which took off eastbound on Belden, the woman said. At 8:40, a Lakeview woman was carjacked at gunpoint as she got into her car behind her home in the 1300 block of West Waveland. The victim reported seeing a minivan pull into the alley moments before an armed man got into her passenger seat and demanded her car keys at gunpoint. Moments later, Chicago police spotted the woman’s stolen Volkswagen heading eastbound on Belmont at Ashland. Officers engaged the vehicle, which fled southbound on Halsted and struck a 23-year-old man in the 2400 block of North Halsted. Police supervisors terminated the chase after the pedestrian was struck. Witnesses reported that the man was seriously injured, but responsive. In a statement, police said the man’s condition had been stabilized. 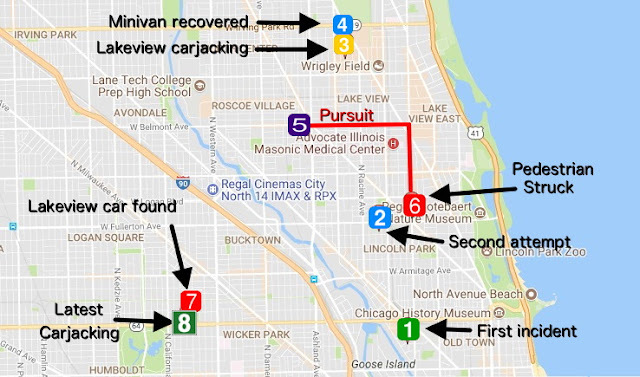 Shortly after 9 a.m., police in Humboldt Park recovered the Lakeview woman’s Volkswagen in an alley behind the 2600 block of West North Avenue. Less than two minutes later and just a block away from where the VW was ditched, another carjacking was reported. A woman told police that she was grabbed by the neck and removed from her green 2000 Honda Accord with Wisconsin plates by two armed men. The Honda sped from the scene and was last spotted heading westbound on Augusta Boulevard near Sacramento in Humboldt Park. Police said the vehicle had severe front end damage after colliding with a series of parked cars. Around 10 a.m., police in Lakeview found the silver Dodge Caravan that was used in the earlier crimes. It had been dumped in the 3800 block of North Wayne, a couple of blocks from where the Lakeview woman was carjacked. Police said the van had been reported stolen in Little Village on Thursday. • Camoflage pants, black hoodie, cornrows, thin build, about 25 years old. According to a police source, investigators will be working to determine if this morning’s carjacking crew is also responsible for a carjacking at Montrose Beach late Thursday night. Around 10:25 p.m., a man reported that a gray Dodge Caravan backed into his Dodge Charger at the beach parking lot. When the victim got out to inspect the damage, the passenger jumped out of the Caravan, became aggressive, and took control of the victim’s car. The victim said that up to eight men involved in the carjacking fled in his car, the Caravan, and a gray Toyota sedan. Please support CWB’s original reporting to receive members-only analysis and services year-round. Subscriptions start at $49 a year or $5 a month. You can also one-time donate an amount of your choosing. Click here — and THANK YOU!